Harlequin Beads & Jewelry is a full-service bead store with a talented staff available for jewelry design and technical assistance. Located in the heart of downtown Eugene, Oregon, owner and operator, Stacy Bierma, opened the store in 1984. She has surrounded herself with a staff of passionate and experienced beaders and chosen beads and beading supplies with a focus on quality and conscientious sourcing - mostly from Europe and the USA. Harlequin offers a huge selection of over 10,000 beads, with an emphasis on Swarovski crystal and pearls, Czech glass and seed, Japanese seed, and precious and semiprecious gemstone beads. You'll also always find a beautiful assortment of handmade glass beads from local artists, as well as a spectacular showcase of finished jewelry on consignment in the store. Most items in the store are available by the piece or in bulk, so you only have to buy what you want. Harlequin can help you get exactly what you need for any project. Locals can order online and pick up their orders in the store to save time, money and natural resources. Harlequin is just as passionate about offering top-quality stringing materials, findings, wire, chain, beading tools and books. 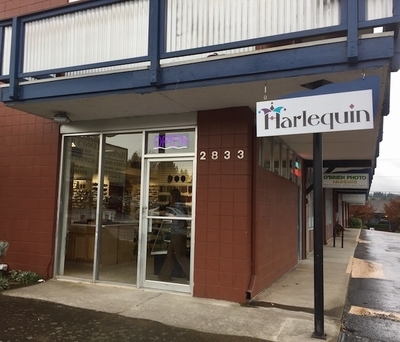 Because Eugene has a thriving beading community, we at Harlequin make sure to always provide a complete selection of beading essentials for jewelry design and crafting. For those who are just getting started, wishing to learn a new technique or brushing up on a rusty area, Harlequin offers an array of beading classes from beginner to advanced levels. Our online video venture will also bring many of our tried-and-true techniques from our instructors to a broader audience online. On top of our regularly updated inventory, Harlequin frequently hosts trunk shows to bring a mini-gem-fair experience to the store. Vendors range from specialty beads and findings to irresistible favorites like freshwater pearls and gemstone beads. Our trunk shows are very popular because they're all about variety and great deals. Many of Harlequin's regulars like to hang out and create right in the store. We have plenty of room for beading and a kindred staff ready to assist you. Tuesdays are the official afternoon when the Harlequin Beading Circle gathers to work on their own projects and share ideas and great conversation with other avid beaders - and newcomers are always welcomed with open arms. Harlequin is dedicated to the local community. We love and appreciate the support that our community provides, so we try to give back. Harlequin donates gift certificates and supplies to local schools. Stacy serves on the board of Willamette Family Treatment Services and Downtown Eugene, Inc. Harlequin is also a member of Unique Eugene, a group of locally owned businesses who support local community groups and create a vibrant local shopping experience. Welcome to Harlequin Beads! Whether you live in the immediate Lane County area of Oregon, or you're visiting our website from a distant town, we hope you will enjoy your beading experience with us. We make every effort to keep our physical and online stores stocked with all the beads and beading supplies that you'll need to complete your jewelry and beading projects. We hope to inspire and enable your beading passion. We always love to hear from you, so we invite you to submit your own customer review. Thank you for your interest in Harlequin Beads and Jewelry. We'll strive to continue providing the beads you can believe in.